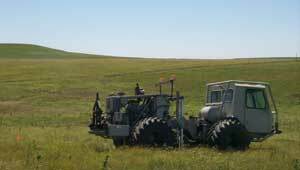 This web site has been created in support of the Kansas Geological Survey's 4-D Seismic Monitoring of CO2 Injection project. For information on this project, please contact Rick Miller, project investigator. Miller, R.D., Raef, A.E., Byrnes, A.P., and Harrison, W.E., 2005, 4-D Seismic--Application for CO2 Sequestration Assurances [Abs. ]: Mid-Contiment Section Meeting, American Association of Petroleum Geologists, September 10-13, 2005, Oklahoma City, Oklahoma. Byrnes, A.P., Miller, R.D., and Raef, A.E., 2005, Evolution of Reservoir Models Incorporating Different Recovery Mechanisms and 4-D Seismic--Implications for CO2 Sequestration Assurances [Abs. ]: Annual conference of the American Association of Petroleum Geologists, June 19-22, 2005, Calgary, Alberta, Canada. Raef, A.E., Miller, R.D., Byrnes, A.P., and Harrison, W.E., 2005, Rock Physics and Seismic Modeling Guided Application of 4D-Seismic Attributes to Monitoring Enhanced Oil Recovery CO2-Flood in a Thin Carbonate Reservoir, Hall Gurney Field, Kansas, U.S.A. [Abs. ]: Annual conference of the American Association of Petroleum Geologists, June 19-22, 2005, Calgary, Alberta, Canada. Raef, A.E., Miller, R.D., Franseen, E.K., Byrnes, A.P., Watney, W.L., and Harrison, W.E., 2005, 4D seismic to image a thin carbonate reservoir during a miscible CO2 flood: Hall-Gurney field, Kansas, USA: The Leading Edge, v. 24, no. 5, p. 521-526. You will need a free Adobe Acrobat Reader to view the PDF files. Readers are available from http://www.adobe.com/.